The children cut out and paint mirror-images of fish, and then make them three-dimensional by stuffing them with wadded newspaper. For ages 6 to 9. Plan 3 to 4 sessions. For each child, align two pieces of brown craft paper and attach them with several staples around the edges to make it easier for the children to cut double images. Set out attached papers, pencils, and scissors. Share the pictures of fish, pointing out the shapes of the bodies, fins, and tails. 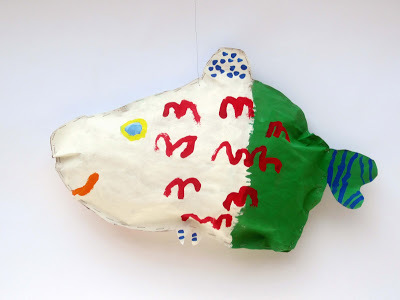 Explain to the children that in this session they will each be cutting out two sides of a fish and then painting them in the next session. After the paintings dry, they will be stapled together and stuffed with newspaper to make them three-dimensional, or viewable from all sides. On one side of their attached papers, have the children draw the contour lines, or outlines, of a fish including its tail and fins. Emphasize that they need to fill their papers with the drawings so the fish will be large enough to stuff. After the drawings are completed, mark both sides of the fish that face out with an "x" to designate the sides that are to be painted. Have the children cut out the fish, reminding them to be sure they are cutting through both sheets of paper. When they are finished, they should have two cutouts that are mirror-images, or images with the right and left reversed. Paint a piece of paper and let it dry. This will be used to demonstrate the process of applying wet paint over dry paint. Set out fish cutouts, tempera paints, brushes, containers of water, and sponges. Once again, share the pictures of fish, this time pointing out the colors, patterns, scales, and eyes. Explain that in this session, the children will be painting their fish cutouts. They can use the designs of a particular fish or create their own. On the demonstration paper, show the children how wet paint can be applied directly over dry paint to make adding details easier. The brush should be dipped often to avoid scrubbing on the paper and dried carefully after rinsing to avoid too much water that will re-wet the paint underneath, causing it to mix with the new color. 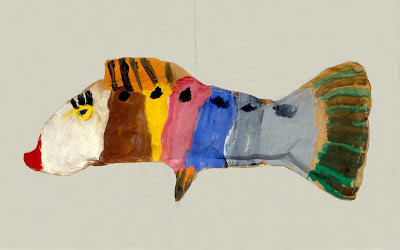 Have the children paint the first layer of color on one of their fish cutouts with the x-side facing up and set it aside. Then paint the mirror-image on their second cutout with the x-side facing up and set it aside. Returning to the first cutout, which has dried by now, paint on the patterns and details. Then paint the same patterns and details on the second cutout. Note: Depending on the length of the session and the size of the fish, two sessions might be needed to paint both cutouts. Set out dried fish cutouts and newspaper sheets cut in half. Set out staplers, paper clips, and glue sticks. 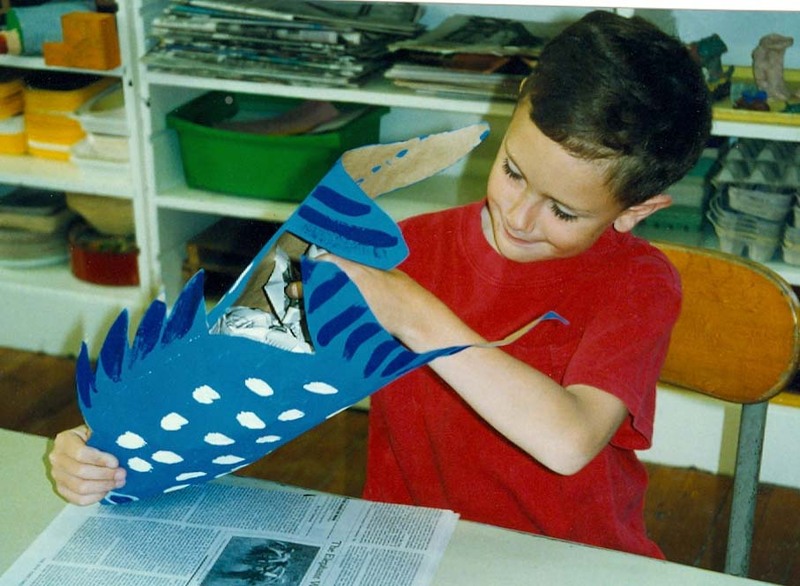 In this session the children will be completing their fish by stapling the sides together and stuffing them with newspaper. Demonstrate how to construct the fish. Line up and hold the two fish cutouts together with paper clips, keeping the painted sides facing out. Staple halfway around the edges of the body, excluding the fins, and stuff the fish with single pieces of newspaper, lightly wadded. Continue to stuff and staple the edges until the fish is completely closed. If the tail is large enough, stuffed it as well. If too small for stuffing, glue the two sides of the tail, as well as the fins, together with glue. Have the children stuff their fish, reminding them to use lightly-wadded, single sheets of newspaper so that their fish will not become too heavy. Note: Hang the fish by poking a hole at the balance point of the fish and tying fishing line to it. A small dab of white glue on the knots will keep them from coming untied. This is a good project to coordinate with classroom work on marine life. The children need to fill the paper with their drawings so that the fish will be big enough to stuff. Once the fish are cut out, knowing which side to paint can be very confusing, so be sure to clearly mark the outward facing sides with an "x." The thick, opaque quality of liquid tempera paint makes it easy and satisfying for children to use. It is also necessary for the process of painting wet paint over dry paint. Plan to help the younger children with the stapling. To keep the fish light weight, be sure to use single sheets of newspaper, lightly wadded. The hanging fish make an impressive display as they seem to be “swimming” in the air. Point out the difference between two-dimensional work, such as painting on the paper, and making it three-dimensional by adding the wadded newspaper. Discuss the characteristics that describe fish. 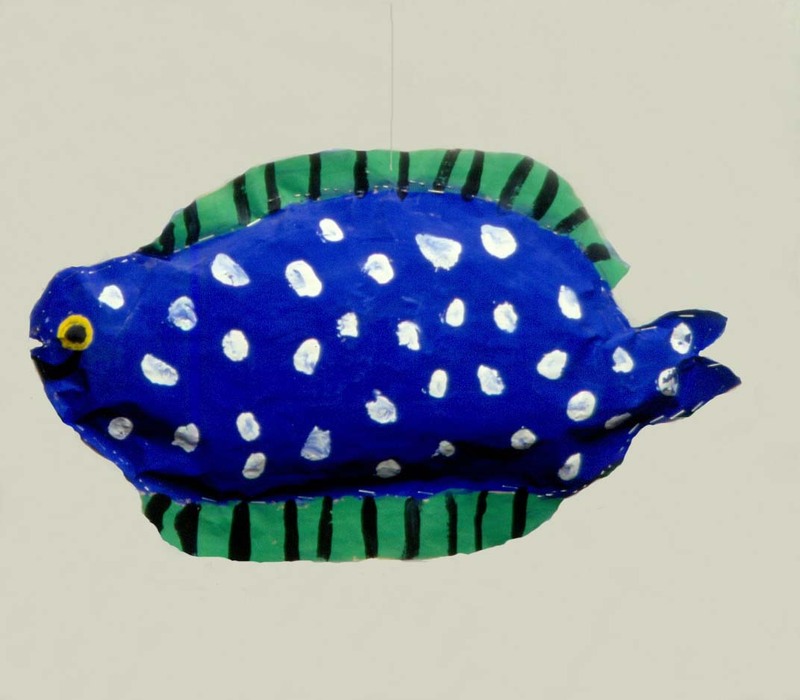 Point out the many interpretations in the shapes, colors, and patterns on the children’s fish. I want to design my own fish. I can’t draw so big. I think I only want a small fish. Uh oh! I only cut out one fish. I can’t get my fish to close up. The newspaper keeps getting in the way. Wow! The room looks like a giant aquarium! When drawing your fish, you need to include the parts which will help us to recognize that it is a fish. Then, you can design your very own fish. A small fish will be hard to stuff, so you need to draw as large as you can. A good way to start is by drawing a big shape for the body and then adding the tail and fins. As you cut out your fish, keep checking to be sure that you are cutting through both pieces of paper. If you've only cut out one fish, trace its shape on your second paper, making sure that the x-marked sides are facing out. Then cut out the second side for your fish. Be careful to not over stuff your fish. 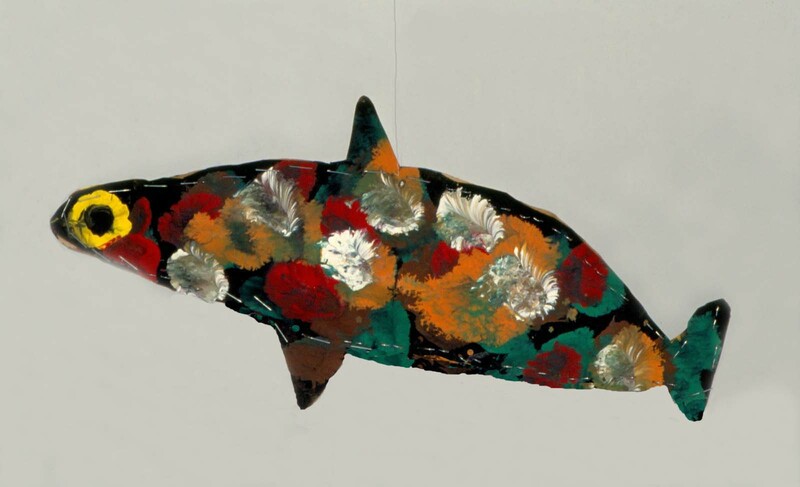 It doesn't take much newspaper to make the fish three-dimensional. Everyone is enjoying the wonderful variety of fish that you created.